148 pages | 6 B/W Illus. Ever since China and Vietnam resumed diplomatic contacts and reopened the border in 1991, the borderland region has become part of the vibrant growing economies of both countries and drawn many from the interior provinces to the borderland for new economic adventures. 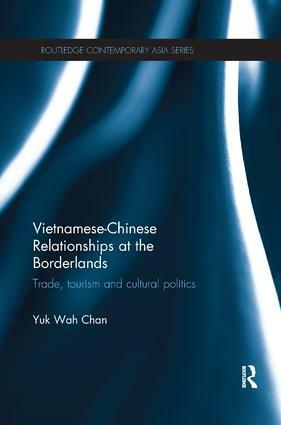 This book examines Chinese-Vietnamese relationships at the borderland through every day cross-border interaction in trade and tourism activities. It looks into the historical underlining of bilateral relations of the two countries which often shape people’s perceptions of the ‘other’ and interpretation of intentions of acts in their daily interaction. Albeit Chinese and Vietnamese have lived side by side for centuries, their interaction in the space of trade and modern tourism in post-war and post-reform China and Vietnam is something novel to both people. The book provides a ‘bottom-up’ approach to examine the localized experiences of inter-state relations. It illustrates the changes the vibrant economic process has brought to the borderland communities, and how the revived contacts and interaction have generated a contested space for examining Vietnamese-Chinese relationships and demonstrating trans-border cultural politics. A novel study of the strategic development of the borderland within the new political economy at China-Southeast Asia border region, this book is of interest to academics in the field of Anthropology, Border Studies, Social and Cultural Studies and Asian Studies. "In this concise, powerful and richly documented study, highlighted with relevant literature references, Chan constantly challenges the general approach of Sino-Vietnamese relationships as conflicting and unbalanced." Chan Yuk Wah is Assistant Professor in the Department of Asian and International Studies at City University of Hong Kong. She is the editor of The Chinese/Vietnamese Diaspora, also published by Routledge.